Maruti Suzuki has finally launched the Baleno facelift model in India today with the starting price of Rs. 5.45 lakh while the top-of-the-line Alpha petrol CVT variant is priced at Rs. 8.77 lakh. On the other hand, the diesel Sigma starts at Rs. 6.60 lakh and the Alpha is quoted with Rs. 8.60 lakh (all prices, ex-showroom, Delhi). The company has already commenced bookings for the new model and the first batch has reached dealerships. 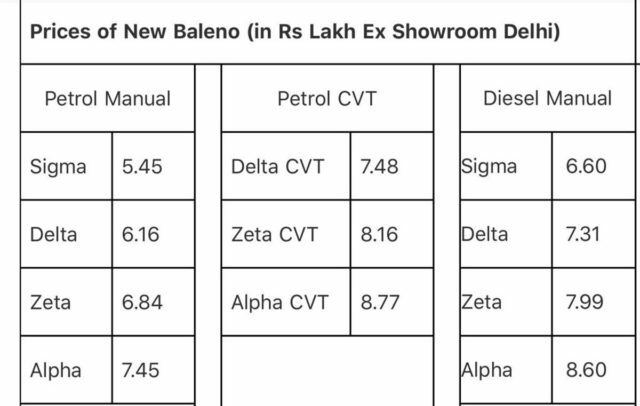 Here is the variant wise features and prices of the facelift model and it is available in four trim levels – Sigma, Delta, Zeta and Alpha. The entry-level Sigma variant is priced from Rs. 5.45 lakh for petrol and Rs. 6.60 lakh for diesel. It comes with the redesigned front grille, new bumper, tweaked LED tail lamps, new black and blue colour for the interior, Built-In Antenna, Power and Tilt Steering wheel, Front Seat Adjustable Headrest, Central Locking, Front Power Windows, Manual AC Front and Rear Accessory Socket, Dual Horn and Gear Shift Indicator. 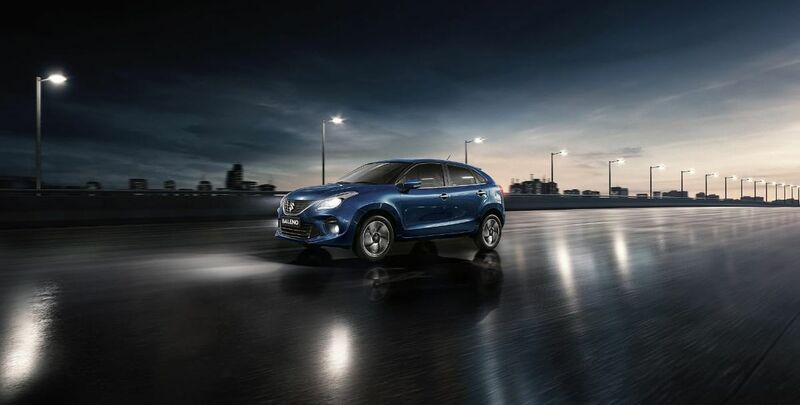 The standard safety features include reverse parking sensor, speed alert system, seat belt reminder, Nexa safety shield, Immobilizer, Headlamp levelling and high mounted stop lamp with LED. The Delta variant comes with all the features from Sigma along with LED projector headlamps with a light guide, turn indicators on ORVM and full cover. 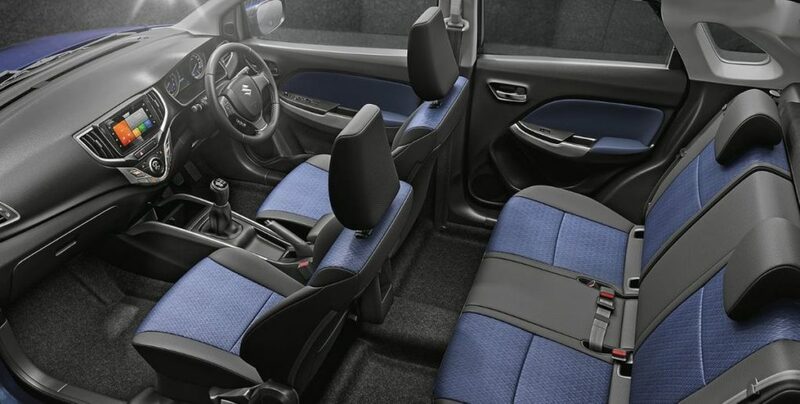 The interior features include a new audio system with electrostatic touch buttons, steering mounted control, electrically adjustable OVRM, climate control, rear adjustable headrest, 60:40 split rear seats, keyless entry, rear power window, auto-up power window, rear wiper and washer, rear defogger and pinch guard window. The Zeta variant comes with all the features from Delta plus new alloy wheels, chrome door handles, new MID display, new touch screen infotainment system, phone connected navigation, remote control through smart-play studio app, height adjustable driver seat, telescopic steering, push button, keyless entry, front fog lamps, projector headlamps and auto IRVM. The Alpha variant gets all the features from Zeta alongside LED projector headlamps with LED DRLs, premium LED rear combination lamp, UV cut glass, leather-wrapped steering wheel, co-driver vanity lamp, voice commands, remote control smartphone app, follow me home, puddle lamps, rear parking camera and auto headlamps. 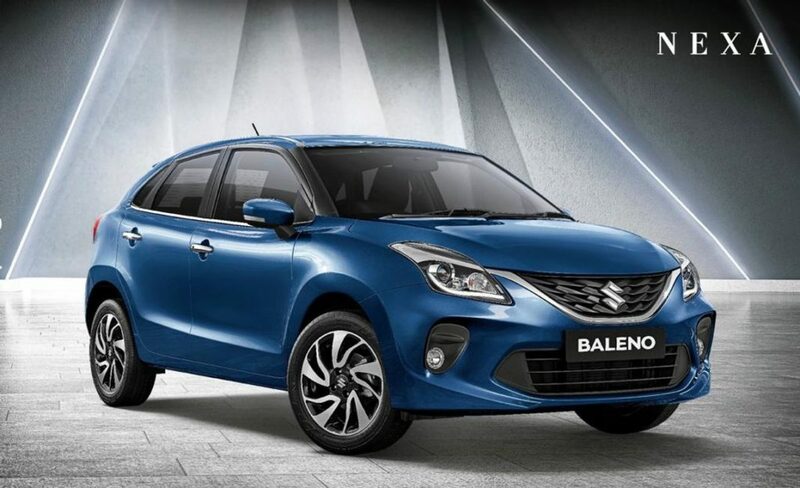 The 2019 Maruti Suzuki Baleno facelift retains the same engines from the outgoing version – 1.2 L petrol and 1.3 L multijet diesel. The premium hatchback comes equipped with 5-speed manual gearbox as standard and CVT is available only with the petrol engine.